Small Wall Mount Bathroom Sink from Renovator's Supply features durable Porcelain Ceramic Construction with Vitreous China Gloss Finish. Easy to Clean, Scratch and Stain Resistant. Easy Lag Bolt Installation Cute Elegant Little Sink for a great space saving design. 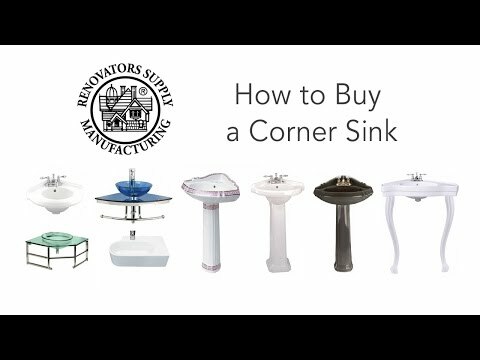 Faucet and drain sold separately. Mounting bracket not required, installs with lag bolts only. 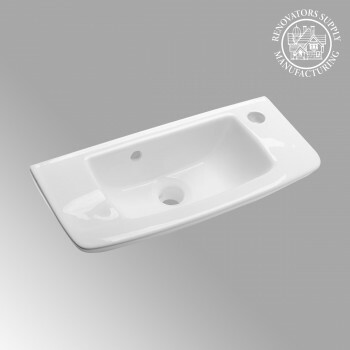 Durable, easy clean contemporary vessel sink. Wall mount sinks save space without sacrificing the luxury of a spacious sink. Constructed from gorgeous Grade A vitreous china ceramic for durability and easy cleanup. RENO-GLOSS finish protects from scratches and stains. OVERALL: 8-1/4" High x 20" Wide x 9" Proj. 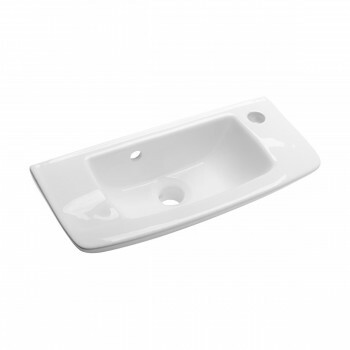 BASIN: 4-1/4 Deep x 12-1/4 Wide x 6-1/2 Proj. One (1) Wall Mount Porcelain Sink Features Authentic Renovator's Supply Logo for ANSI Compliance Requirements.